The area I live in is more like a small collection of communities. 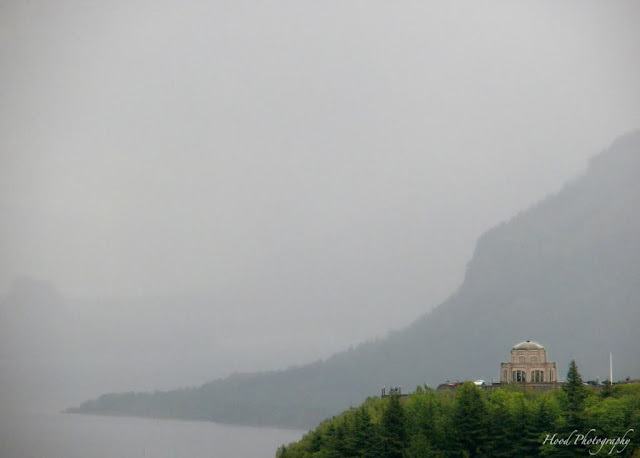 Gresham, Troutdale and Fairview mark the beginning of the Columbia River Gorge when heading east from Portland up I-84. 5 miles up the gorge you come to the exit that leads to the small community of Corbett, and on the outskirts of Corbett sits this beautiful view. Crown Point, to me, is one of my favorite places to visit, since I think its one the most gorge-ous (you see what I did there HAHA) sights to see if you come to visit our area. This photo was taken last spring, and the hills the Vista House sits on will soon be that green and leafy again! Click here to view thumbnails for all participants in this months theme day for City Daily Photo. Oh, what fun memories! I love Crown Point and the Gorge! I've been there numerous times and love it! Terrific capture for the G Day! Hope your week is going well! Beautiful. It looks like the setting of some mysterious game or movie. I couldn't begin to count the times I've driven I-84 and it was different each time. You've captured a gorge-ous(YES)view! We were there on vacation the summer of 2009--What a fantastically beautiful place! I loved the waterfalls and the hikes along the Columbia River. Thanks for the memories! Great shot! I was gonna ask if this was near Vista House. I saw it from the highway when I went to Multnomah Falls. A fun pun, and a wonderful view. Good work! Love this Gorge-ous shot. the heavy cloud cover gives the scene a touch of mystery. Really nice. The place you live looks really calm and relaxing. Have a nice day. what a majestic place...gorgeous indeed! Great to be here. Hope you can take a look at my ABC Wednesday entry as well. Thanks!